Collected from dozens of interviews with, and reports from, Iraqi feminists, labor organizers, environmentalists, and protest movement leaders, Against All Odds presents the unique voices of progressive Iraqi organizing on the ground. You can find the accompanying Organizing & Study Guide here. Conscientious objection to military service is most often viewed, and written about, as a moral stand that an individual takes against an injustice in a particular conflict, or against the injustice that is war itself. But conscientious objection is also a form of political action, and a focus for campaigning and organising. As such, it has its particular strengths, and faces particular challenges. This book has been created by and for organisers and campaigners working on conscientious objection all over the world. It contains short articles, brief case studies written by conscientious objectors and experienced activists from five continents, who tell about their actions and campaigns, share tips for successful campaigning, and discuss the difficulties their movements are facing. The chapters of the book cover a broad variety of political and social contexts in which conscientious objection movements operate and address the specific features of conscientious objection on different ideological grounds. They also pose some tough questions conscientious objectors have to face if they want their movements to be sustainable and to avoid reproducing the very same militarised and patriarchal social structures that created the injustice to which they respond. A new book from War Resisters' International has been published this week. Written by and for activists all over the world who are campaigning against war, militarism, and all kinds of injustice, it will be of use not only to conscientious objector movements. Conscientious Objection: A Practical Companion for Movements is full of ideas to help groups work together, deal with power dynamics, surmount the external challenges they face, and enhance the concept of conscientious objection, using it in new and innovative ways — like resistance to war profiteering, or the militarisation of youth. The book pays particular attention to the question of gender and the often invisible role of gender, both in the war machine and in the movements that oppose it. We believe this is the first book of its kind, we know it has lots of original content, and we hope it will become an invaluable resource in the worldwide peace movement. It will soon be available online, and you can purchase a copy here. Thank you to the many people who contributed to our crowdfunder, which made this book possible, and to all those who contributed to the book through writing articles and translations. Two books for the price of one! 2nd October is 'International day of Nonviolence', so until the 9th October, if you buy a copy of the 2nd edition of the Handbook for Nonviolent Campaigns, we'll include a copy of the first edition to pass on to a friend! Both editions are available in English and Spanish. 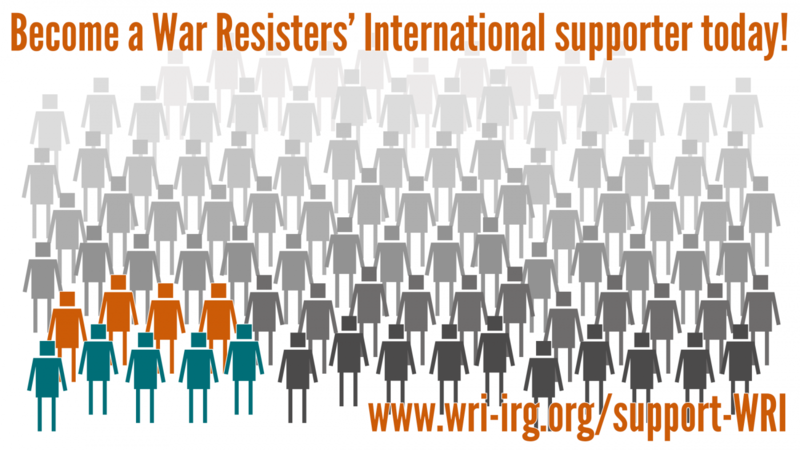 In 2009, War Resisters' International released the 'Handbook for Nonviolent Campaigns'; a toolbox of ideas and resources to support activists to run more effective campaigns. The full first edition is available online here: www.wri-irg.org/pubs/NonviolenceHandbook. The original was translated into over ten languages, including Spanish, German, Tigrinya (spoken in Eritrea), Nepalese, Turkish, and Arabic, and has been used by activists all over the world. The Second volume of A Guide to Civil Resistance is available now. The guide considers indigenous, feminist, LGBT and regional movements in different countries and provides a global perspective on struggles for peace, the environment and social justice. It highlights a variety of nonviolent strategies and range of tactics from kiss-ins and public fasts to blockades, protest camps and civil disobedience. Howard Clark, former Chair of WRI, worked on the first volume of the book, and his work is also very present in the second volume, which uses some of the work he did for the guide's website. Download the pull book as a pdf here.